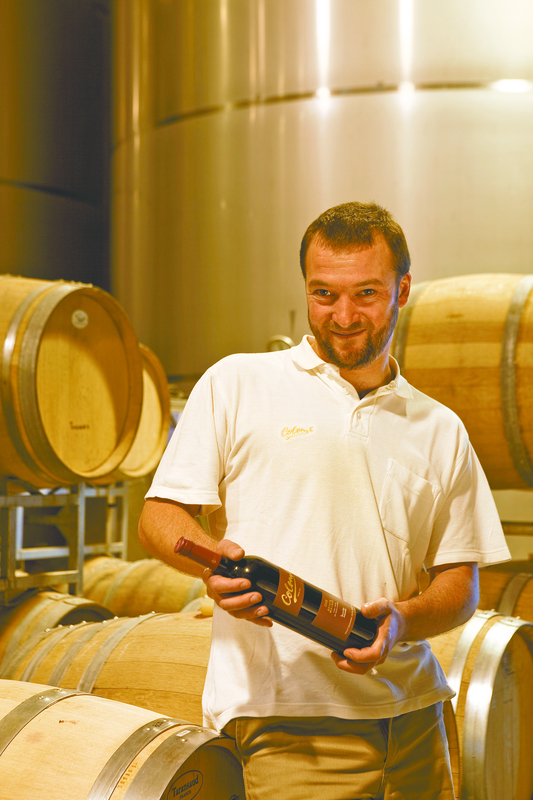 Bodega Colomé’s head winemaker talks about living in Salta. When did you first visit Argentina? The first time was in 2001 for six months. I spent time travelling around Chile, Bolivia and Peru as well from January to June. It was my first approach to South America and I had a really good time on that trip. I learned Spanish as I didn’t speak a word before and I also learned about Argentines and fell in love with the people. I was hitch-hiking and did a really big tour of the country. I went from Buenos Aires to Ushuaia, and came back on Route 40 up to Mendoza. I was very enthusiastic about being in Argentina. What did you do after that trip? I worked in Bordeaux but then in 2004 I decided to leave France for Argentina, but this time for a year. I wanted to spend more time here but also wanted to return to start up my own project in France, and I felt that that would be my last trip. This time to Iguazú, to Córdoba and more in the centre and also Salta. I hadn’t been there on the first trip and I really fell in love with Salta and lived there for six months. It is always the same story and it is because of a girl! My girlfriend at the time was learning Spanish in France and she wanted to improve by coming to South America so I came with her. That first trip was a revelation and I had come here without any real expectations, but I really felt welcomed by the people, and the richness of the landscape was wonderful. So I vowed to come back with more money and have a more intense trip. That’s what made me come back, and also made me stay. How did you support yourself in Salta? I taught French at the Alliance Française and also did wine tastings. It was fun and I did these little jobs to earn some money. Then, at one tasting, I met a friend of Donald Hess, the owner of Colomé, who told me about him and the fact that he was a Swiss guy who was putting together a winery up in the mountains. She asked me if I was interested, and I said “why not”, so I sent off my resumé, and Donald Hess phoned me. That was August 2005 and he was looking for a wine maker. Yes, it’s very far away from everything. It was a tough decision but it was a huge project and I was 27 then and had no experience working in such a huge winery like this. So I said no to the job as I felt it was too difficult for me. But Donald convinced me, saying people would help me, and that I’d have a winemaker from the US coming to help twice a year. So I said yes, thinking it would be for a couple of years. But I’ve now been at Colomé for six years and it’s been a great experience but also very challenging. Do you feel isolated there? The key to living in Colomé is to be well-integrated and I never feel like I’m not part of the community. Sometimes when I come back from Europe I think that I don’t have access to much, but I feel very lucky as I look from the outside, I can see all this crazy movement and need to consume. It’s like a luxury to not have the pressure to go and buy stuff. I don’t even have a supermarket on the corner. Yes, we are far away but I think we’re lucky to be far away. And when I stop feeling like that, then it’s time to leave Colomé. Are you from a similar area in France? No, there is nothing similar as this is like an oasis in the middle of nothing. Just 400 people live in Colomé but it’s a four-hour drive to Salta and so I’m really in a little community. That community life and being with warm people is something I’ve discovered which I think we are losing in Europe, that contact with people. The landscape is very different too. Here is like a desert whereas Burgundy is very green with lots of little hills. They are totally different. Are you from a family of wine-makers? No, although my parents work in agriculture. I’m the first one in the family to make wine although everyone is drinking it! I started working in 1998 and worked three years in Burgundy, and three years in Bordeaux. What are the differences between French and Argentine wine-making? Although I had my knowledge base, I had to learn a lot of new things, such as understanding the soil and weather. It was quite challenging as it is totally different. The first year wasn’t easy as I made wine like I had in Bordeaux and that style wasn’t adaptable to Malbec. I made it very oakey with quite a lot of tannins and that isn’t really what we want. So I had to learn all this which was great as at least it isn’t boring! In France the largest winery I worked for produced 50,000 litres a year and now I’m producing one million litres a year. To have great quality in France, the idea is not to produce much wine. I had to accept I could make a lot of wine but keep quality. The logistics are also difficult. Salta is an eight-hour round trip away and all the dry goods I need, such as corks, bottles, cases, come from Mendoza which is 1,600km from here. I also had to learn I can’t pick up the phone and order bottles for tomorrow. I have to think months in advance, as things move slower. I learnt all this the hard way as the first year, I thought I’d bottle the following week but it happened two months later as they didn’t have any bottles in stock! It’s a question of organization, and the differences of managing a small winery and a big one which is also far away from everything. I try to work 10 days in Colomé, then have five days in Salta. I work all day long and when I have free time I like going trekking and walking in the mountains. We have a great landscape for doing this. You can’t go for a beer or go dancing so you have to find other hobbies so I read quite a lot and also go horse-riding. My girlfriend lives in Salta so we spend time together, and I try to have friends who don’t work in wine, so although we may be drinking it, we aren’t necessarily talking about it! We’ll go out to dinner and although there isn’t much theatre culture, there are lots of nice folk music clubs and events. What do you miss from France? The cheese! But also the diversity of the food. I do love asado here, and it’s something which makes me stay here, but there isn’t the same variety. I’m quite lucky as in Salta there is quite a lot of influence from Bolivia with foods made from corn so I think it is quite diverse. The first time I came to Salta my group was mostly French as there were lots of interns who came to work in tourism, but once they left I stayed friends with the Argentines from that same group. I did realize that if we were all French people then we didn’t really open up to others that much so it’s not a coincidence that I have Argentine friends, so that I have better integration in the country. Do you let your friends drink anything other than your wine? Sure, always! We have a great place in Salta we go to, which is a wine shop that also does picadas and we always try new things. They already know my wines very well but we like to compare it with other wineries. And I’ll always bring back different wines from my travels too so they can try something different. Do your friends in France think French wine is better? I have a lot of French friends who are wine makers and when I left France, they weren’t very open minded in the beginning but now they have learned about it and tried it — and they like it! Although they don’t like all of it — not the powerful stuff such as the reserva we are doing as it’s too concentrated but they like our Torrontés, so I am teaching them! And, of course, my family love it as it is their little son who is making wine! But in reality I’m very happy to open the minds of French wine makers. In a recent two-week trip to the north-west of Argentina and in a bid not to let the Expat interviews lapse despite a physical absence from the Herald newsroom, I undertook a mission to unearth more foreigners and rummage about in their lives, despite the fact they don’t reside in Palermo — and probably don’t want to. Headed to Salta and Jujuy provinces for research reasons, a quick message posted on the microblogging site Twitter brought out a dearth of expats located in Salta recommended by online friends of mine. Even former Herald proofreader Ricardo Jones managed to chip in with a British hostel owner in Salta capital. I needed to put the call out as the only two people I know who live in the province, Hugh MacDermott in the city and Diane Romero from Cafayate had already been “expated” three years ago. Plenty of people working in tourism emerged — although I didn’t get a single bite in Jujuy — and one woman of particular interest, Leigh Shulman, runs an NGO with her partner which works with Wichi native Indians. More from her next week. Rumbling up the dirt tracks to the village of Colomé, some 150km south-west of Salta city, in a regular car (by which I mean not of the four-wheel-drive variety, and when one isn’t sitting head and shoulders above the rest of the drivers with an almost bird’s eye-view of the gravel ahead, there is a touch of the green-eyed monster as you watch those 4WD monsters whip up mountains and sturdily cross streams and rivers when you’re in the equivalent of a plastic bag). Six hours and a mere 150km later, arriving at Colomé in one piece (although I’m not entirely certain about my four-wheeled plastic bag’s undercarriage), being greeted with a glass of house Torrontés was the only way to put the lengthy journey behind me. Although the winery now only offers lodging facilities to groups rather than individuals, I was allowed in for a night and had the privilege of dining with its oenologist Thibuat Delmotte. It was a surprise to meet the Frenchman so far from “civilization”, who later recounted the responsibility he was entrusted with by the winery’s owner. Colomé is 18km from Molinos and 50 km from the rather larger Cachi but, regardless, is remote. Far from modern amenities, bars, shops, indeed culture as we know it. But a fabulous place to spot stars (in the sky) at night, glass of wine in hand.